A: Absolutely! I'm Matthew Miller, and currently I have the privilege of being the Fedora Project leader. Before that, I worked at Harvard School of Engineering and Applied Sciences as a systems architect and, because I can't leave well enough alone, agile/devops rabble-rouser. And before that, I was at Boston University's central IT department, where I worked on our bespoke BU Linux distribution. In some ways, I'm still a sysadmin at heart, but I try to listen and understand the mysterious ways of software developers, end users, and everyone else in the free and open software ecosystem. Q: You're giving a talk on Fedora.next: Bringing Change to a Classic Distro (without too much kicking and screaming). Without tipping your hand on the actual talk, can you give us an idea of what we might expect? areas that needed it without losing the good parts, including Fedora's core values and vibrant community. A: It is my first visit. I won't lie — right now, I'm probably _most_ excited about escaping the snow under which my Boston-area house is buried. But a close, close second: I'm excited by the enthusiastic community I see around this event, and the schedule of talks looks like it'll be hard to choose where to be at any given time. 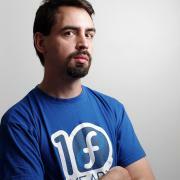 Q: Is your talk aimed mostly at Fedora users and community members? Are fans of other distributions welcome? A: I hope to see an audience with backgrounds in many different distributions, so I can share our lessons and learn from yours. There's a lot of awesome in the Linux community and we can all benefit from collaboration!